Marcus thanks her dearly for all the many sacrifices she’s made for their family and, yes, he still loves her. But he loves Cecila too. Soo polyamory? They try to bring their family together but Drizilla was so young when Rapunzel left she’s clearly bonded with Cecila more: while Anastasia still loves her mother Rapunzel, Drizillia is just drifting away. And Once Upon a Time can only bring together blended families after a few seasons of crawling over broken glass. It’s a thing. Can we have an aside to say this is not a good message. Being good is not always or even usually rewarded (and a poor motive for being good besides): nor is being evil always punished. Someone without a “happily ever after” has not earned that through their deeds. She’s in prison at the moment and Drizilla visits so they can both practice venemous barbs - Drizilla wants Anastasia but Victoria won’t say where she is. She has another plan to get out of prison: Rumplestiltskin. She lays it out quickly to Rumple that she knows the truth and after much poking and invoking Belle he finally admits it: Because he has information on the Guardian, this unknown person who will be able to take the power of the Dark One, not go evil and therefore allow Rumple to reunite with Belle in a whole convoluted fashion. Rumple agrees to get her out of prison for this. Oh does anyone believe this? Why isn’t Tiana giving her serious dubious eyes? Rapunzel goes on to collect more shinies with Rumple playing chauffeur, followed by Drizilla and Gothel being very very unsubtle. Rumple tries to call Rapunzel out on this because he finds it highly dubious she’s jumping through so many hoops for one daughter and completely ignoring the other one. And he knows what it’s like to have a son who hates him but he still fought for reconciliation and to be reunited. Time to catch up on what happened to make Anastasia comatose in the first place: to the fairytale land. 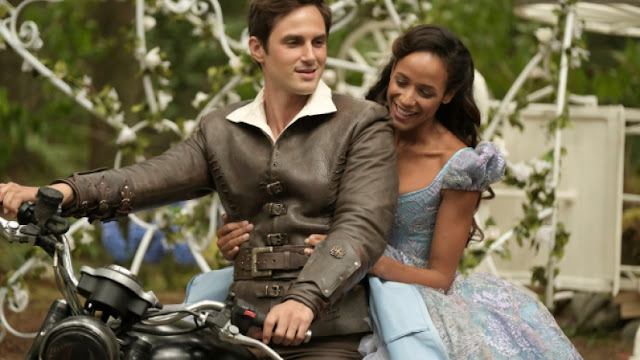 With Cecila magically poisoned and made to flee, Rapunzel gets back with Marcus (sorry but I’m increasingly becoming suspicious of Marcus and think he may be a colossal fuckboy) and even accepts Ella and everything is happy. Sort of. Until Ella and Anastasia fall through a frozen lake - Marcus jumps to save them and saves Ella, only having chance to save one. Rapunzel is most not amused that he didn’t save their daughter (so, so much for the whole Ella acceptance). And leaves me wondering if Gothel is trying to find the goodest of goodie two shoes then, perhaps, she has an underlying positive motive? Or are we looking at needs the super good for nefarious means. In the present, Gothel and Rumple exchange barbs - with Gothel revealing Rapunzel is after his great-grandaughter - Lucy. Which, honestly, I’d completely forgotten. Everyone on this show is related. Rumple goes looking for Lucy but instead finds Killian who has just broken into Rumple’s storage locker which has lots of ominous artefacts, like Killian’s own hook - and files on everyone. Shame Rumple’s not doing anything with them. But following up on his old cases he finds that Rumple is asking people to touch his Dark One Dagger (behave) to see if they feel anything. I mean, really? Rumplestiltskin, the Dark One, who plotted for several seasons in ever more convoluted ways is reduced to handing people his dagger and asking if they feel woo-woo?